Now I knew the drill: bus – hostel – bus – hostel – bus – and it already had gotten a little bit boring. So I decided to travel a bit differently from now on. 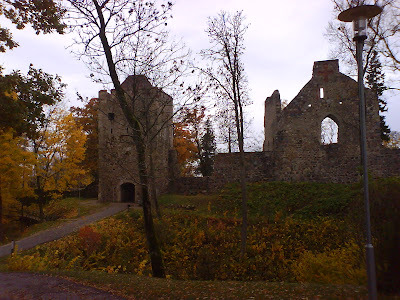 From Riga I took a very slow train to Sigulda where a nice castle should be located. I didn’t see much of it, but I did see some ruins that – well, judge for yourselves. It was two PM already, so I had to really start being concerned about my trip to Tallinn. I walked back to the train station of Sigulda, and caught a bus to Saulkrasti that was already waiting. An old woman affirmed its direction and fee of 1.7 Lats (about 3 Euros). I guess I was lucky again. The bus ride went to typical Latvian scenery I was glad not to have missed, and ended near the coast, that is the Bay of Riga. I walked down to the beach the sun set, creating startling visual dreams I pointed my Mobile’s camera at. After that short seaside delight I bought some bread and cheese, took a piece of cardboard and wrote “Tallinn” on it. At first, all the cars just drove by. Then an older couple kindly brought me to the main highway, the via baltica, where I’d have a better shot. And indeed. From a gas station a young man took me to some know hitch hiker’s point, I stood there a couple of minutes holding my cardboard up, and then a friendly woman brought me to another town, 30 kilometer or so down the rode. From there, a truck driver took me straight to Tallinn. So it was pretty easy to get a ride, though uncommon in autumn times. I had been called a hippy smoking grass, and would probably have remained like that in their memories had I shown my Dutch passport. The truck ride was beautiful in its way. We were silent most of the time, and I enjoyed the Estonian scenery bathing in the moonlight. After we reached Tallinn, we had to wait half an hour because of some company rules, the driver told me. I walked towards the Old Town, as I had done in those other cities before, and was picked up by Alar, my host from couchsurfing. Did I already mention it? Well, it is one of the greatest inventions on the Internet. Check it out. So we went to a party(!) Yes, I ended up dancing in an apartment with really nice Estonian people, DJ-ing Depeche Mode, Shantel, Michael Jackson from a laptop computer, drinking gin-tonic and talking philosophy and art history. At four we went to Alar’s place, where I slept like a little lamb. Now that’s some way to arrive in a new city, don’t you think? 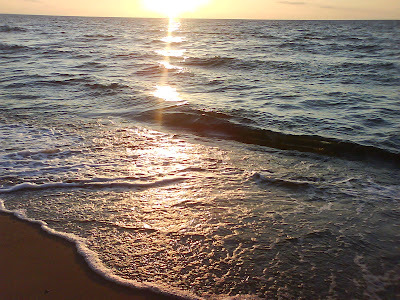 beautiful seaside with sunset, the best for stepping the waves.